The L.A. Summer Residency offers artists and designers the opportunity to work side-by-side in an immersive environment within the vibrant art and design community of Los Angeles. 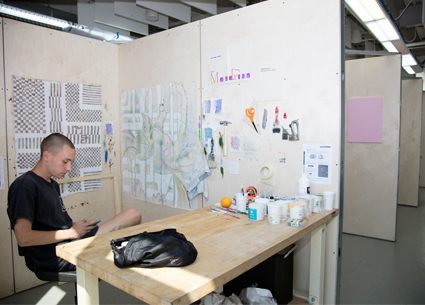 Through access to Otis College's advanced production studios, facilities, and deep engagement with the Los Angeles contemporary arts community, participants can produce unique work and investigate new ideas. Artists and designers will be hosted at our housing and dining facilities, minutes from LAX and the Pacific Ocean. This year there will be two sessions of the L.A. Summer Residency. Session A will take place May 19 - June 7.Session B will take place June 9 - June 28. Priority applications are due by January 30, 2019 to be considered for a fellowship. The Summer Programs Office will conduct a first round review and accept residents after the January 30, 2019 deadline. Residents who apply by the January 30, 2019 deadline will be considered for fellowships if the fellowship portion of the application is complete, priority preference of residency session, as well as early acceptance to the program. It is highly recommended international applicants apply by the priority deadline to ensure the appropriate arrangements can be made to attend the Residency. Applications will remain open and notifications of acceptance will be sent on a regualrly after the priority deadline until the start of the program. There is no application fee. The fee to attend the residency is $2,800, which includes room and board. There are limited fellowships available for the program. To be considered for a fellowships you must complete your application by the priority deadline of January 30, 2019. First round notifications of acceptance will be sent out via email in February and second round notifications will be sent out via email in March. A deposit is required to secure your spot in the residency after notifications go out. Applications are now open! Please click the apply now button below to begin your application. You are able to save your application and return to it at anytime before the application deadline. Sign up to be notified of additional information regarding the LA Summer Residency. As a participant in the LA Summer Residency, you will have access to many of the College's resources including the Labs and Shops, Studio spaces, as well as the dining and housing facilities. 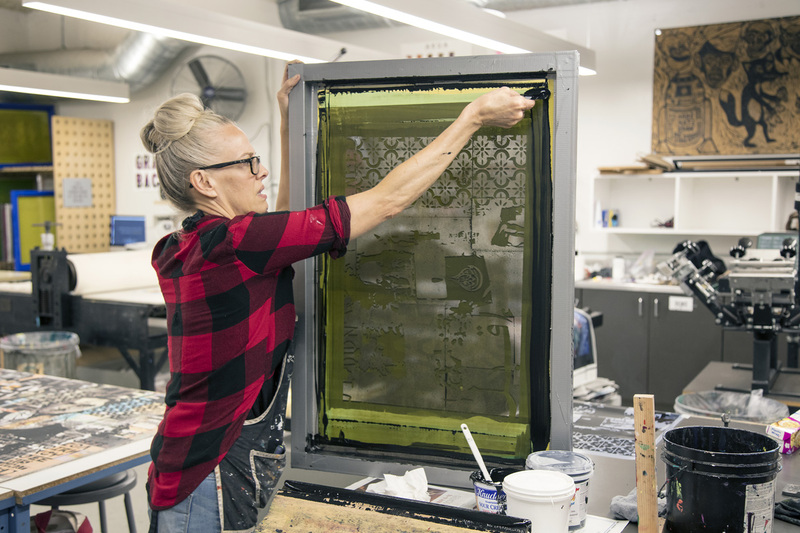 Otis College facilities include: Painting Studios, Photography Lab, Lighting Studio & Green Screen, Video Lab, Laboratory Press, Wood, Model and Metal Shops, Printmaking Lab, Sculpture Studio, Ceramics Studio, and more. To learn more about our facilities, please check out Labs and Shops. Each artist or designer, when applicable, will be given their own dedicated, semi-private, 24-hour access studio space. Each studio measures approximately 8 feet by 8 feet. Please refer to the above images to view an example of last year's studio set up. There will be power and additional lighting available based on need. We also ask that you include your plans for your time at the L.A. Summer Residency in your application so an adequate space for your needs can be provided. During your time at the L.A. Summer Residency, you will be housed in the new Otis College Residence Hall. The Residence Hall is located on the Otis College campus, minutes from your studio as well as Otis College's labs and shops. You will be sharing a traditional quad suite with one other artist/designer during your stay. Each quad has two self-contained, unique keycard bedrooms. You will share a common space along with the bathroom with one other Resident. Included in your stay are linens and towels, however, you may want to bring your own for your comfort. Each floor contains coin-operated laundry facilities and a live-in staff member to answer any questions or concerns that may arise. When checking in, you will be given a unique keycard that gives you access to the Residence Hall along with your meals at the Otis College dining commons. The LA Summer Residency has a number of programs part of the Residency including, a Keynote Speaker, Artist Nights, Visitng Artist, and a trip to an LA cultural institution. Programs, speakers, and trips will be added to the website as they become confirmed. At the opening reception of each Residency there will be a keynote speaker to kick off the Residency. Our Keynote speakers will inspire, generate questions, and set the tone for the Residency. Keynote speakers will be added to the website below as they become confirmed. Diedrick Brackens (b. 1989, Mexia, Texas) works in the Leimert Park neighborhood of Los Angeles. Brackens received his BFA from University of North Texas, in 2011, and MFA in textiles from California College of the Arts, in 2014. His work has been shown in solo exhibitions at Ulrich Museum of Art, Wichita (2017); Various Small Fires Gallery (2019); Johansson Projects, Oakland (2015). Group exhibitions include the Hammer Museum's Made in LA (2018), SOMArts, San Francisco (2014); Berkeley Art Museum, Berkeley (2014); 3rd Ghetto Biennale, Port-au-Prince, Haiti (2013); and Museum of Geometric Art, Dallas (2011). Brackens is a recipient of the Joyce A. Wien Prize from Studio Museum, Barclay Simpson Award from the California College of the Arts (2014) and Clare Hart DeGolyer Memorial Fund (2011). Kade L. Twist, is a poet and interdisciplinary artist working with video, sound, interactive media, text, installation and land. Twist's work combines re-imagined tribal stories with geopolitical narratives to examine the unresolved tensions between market-driven systems, consumerism and American Indian cultural self-determination. Mr. Twist is the founder of Postcommodity, an interdisciplinary artist collective. With his individual work and the collective Postcommodity, Twist has exhibited work nationally and internationally, including: the Whitney Biennial, documenta and the Carnegie International. Mr. Twist is a US Artist Klein Fellow for Visual Arts, and Postcommodity have been the recipients of grants and fellowships from the Harpo Foundation, Joan Mitchell Foundation, Art Matters, Creative Capital, the Native Arts and Cultures Foundation and the Ford Foundation. Mr Twist is an Associate Professor of Art and Social Practice at Otis College of Art and Design in Los Angeles, CA. Visiting Artists and Curators are local Los Angeles practicing artists who participate in the program. Each resident is assigned a Visiting Artist or Curator who will complete two studio visits at the residents' on-campus studio to provide critique as well as an artist or curator talk to the entire residency community. For the full biographies please see the Visiting Artists and Curators Biography section below. Below are the list of confirmed Visiting Artists and Curators. More Visiting Artists and Curators will be added as they become confirmed. Los Angeles is a wonderful, creative, and diverse city full of cultural institutions that foster the arts. As part of the residency, residents are invited to explore a sponsored trip to a cultural institution in Los Angeles. Many times this trip is in accompanied with a focus on the development of the residents and can include meeting the curator or program director of the space, receiving a guided tour, or other special events. Residents are also encouraged to explore on their own and receive a list of upcoming events such as lectures and gallery openings happening throughout the city during their time at the residency. During the residency, participants are invited to share their work with fellow artists in an informal and intimate setting on select evenings. Artist Nights are run by program participants and encourage artists to share their work and talk about their practice and creative goals. Critiques are offered in a supportive environment and artists have the opportunity to inspire each other. Our staff are busy planning a number of Visiting Artist for the LA Summer Residency this year. Visiting Artist biographies will be added as they become confirmed and are received for 2019. Neha Choksi works in multiple media, across disciplines and at times collaboratively and in unconventional settings to explore how we seek, experience and acknowledge losses and transformations in material, temporal and psychological terms. Increasingly her work includes her own intellectual, cultural and social contexts. She works by setting up simple situations and memorable interventions in the lives of everything—from a stone to a plant, from animal to self, from friends to institutions—disrupting logic to open a space for poetry, absurdity, humor, surprise and existential insight. Her work has been exhibited or performed at 18th Street Arts Center, Santa Monica (solo, 2018); Hammer Museum, Los Angeles (biennial, 2018); Dhaka Art Summit (solo, 2018; group 2016); Manchester Art Gallery (solo, 2017); LAMOA at Occidental College, Los Angeles (solo, 2017); 20th Sydney Biennale (commission, 2016); Hayward Gallery Project Space, London (solo, 2015); Kochi-Muziris Biennale (2014); Armory Center for the Arts, Pasadena, California (2013); Whitechapel Gallery, London (2013); John Hansard Gallery, Southampton, UK (3-person, 2012); Asia Pacific Triennial, QAGOMA, Brisbane (2012); Shanghai Biennale (2012); Wanås Foundation and Kristianstads Konsthall, Sweden (2012); the Venice Architecture Biennale (2006); among others. She was awarded the India Today Best New Media Artist of the Year Award (2017) and the designation of Cultural Trailblazer by the City of Los Angeles DCA (2017/2018). She serves on the editorial board of the Los Angeles-based arts journal, X-TRA. For more information, see www.nehachoksi.com. Meg Cranston is an artist, curator, and writer and editor. Her work has been shown in museums and galleries internationally including the Nuer Aachen Kunstverein, Aachen Germany, The Getty Museum of Art and the Museum of Contemporary Art and the Hammer Museum, Los Angeles, The Carnegie Museum, Pittsburgh, K21 Museum, Dusseldorf, and the ICA, London. She has taught art theory and criticism as well as studio art for many year and is currently the Chair of Fine Arts at Otis College of Art and Design. Nikita Gale is an artist living and working in Los Angeles, California. She holds a BA in Anthropology with an emphasis in Archaeological Studies from Yale University and holds an MFA in New Genres from UCLA. Gale's practice is often structured by long-term obsessions with specific objects, or classes of objects and the ways these objects gesture towards very specific social and political histories. She uses ubiquitous consumer technologies as frameworks to consider how individuals potentially reproduce their relationships to objects within their relationships to psychic space and political, social, and economic systems. Todd Gray lives and works in Los Angeles and Ghana. He received his MFA from California Institute of the Arts. He is Professor Emeritus, School of Art, California State University, Long Beach. Gray works in multiple mediums including photo-based work, sculpture and performance. Gray’s work explore issues of blackness and colonialism, most recently with images of Michael Jackson (he was Jackson’s photographer in the ’80’s) , diaspora, and contemporary/historical examinations of power. His work is included in the permanent collections of the National Gallery of Canada; San Francisco Museum of Modern Art; Los Angeles County Museum of Art; Studio Museum, Harlem, NY. Gray is a Rockefeller Foundation Bellagio Center Resident Fellow and a John S. Guggenheim Fellow. Jo Lauria is a Los Angeles-based curator, author, and educator who is a specialist in the fields of craft, decorative arts, and design. She has explored objects and environments that define the American lifestyle and culture through publications and exhibitions. Lauria is the organizer of several museum-based surveys and national touring exhibitions, and is currently the adjunct curator of the American Museum of Ceramic Art (CA). Additionally, as Mentor Faculty at Otis College of Art and Design, she has guided students in their artistic pursuits and has contributed meaningfully to the academic environment. Currently, Lauria is coauthoring a comprehensive text on William F. Cody, visionary 20th century American architect, and developing major survey exhibitions for American museums. Alex Slade is a Los Angeles-based artist working in both photography and sculpture. Since receiving his MFA from Calarts in 1993 he has been looking at various aspects of the landscape with an eye turned toward the urban system, its economy, and the perceptual field it engenders. Recent projects have focused on the disappearing modernist moment in architecture and shifting patterns of development in both the city and its inexorably linked countryside. His work has been included in exhibitions throughout the U.S. and internationally including: the 2017 California-Pacific Triennial at the Orange County Museum of Art,The Whole Earth California and the Disappearance of the Outside, at the Haus der Kulturen der Welt, Berlin in 2013; Eloi:Stumbling Toward Paradise at the California Museum of Photography, 2007; Tomorrowland, Calarts in Moving Pictures at the Museum of Modern Art, 2006; as well as part of the Liverpool Biennial of 1999, the Prague Biennial of 2003 and Snapshot – New Art from Los Angeles at the Hammer Museum in 2001. He received a CCF individual artist fellowship in 2006 and a COLA fellowship in 2007. His work is represented by Edward Cella Art and Architecture. He is Assistant Chair of Otis College of Art and Design’s Fine Arts program. Residency participant Sherrill Roland explains The Jumpsuit Project and how his practice expanded during his time at the L.A. Summer Residency at Otis College. Residency participant Heather Merckle describes her process and what Otis College's production studios offered during her residency experience. Residency participant Orly Ruaimi on working with artists from across the globe in the creative community of Los Angeles. 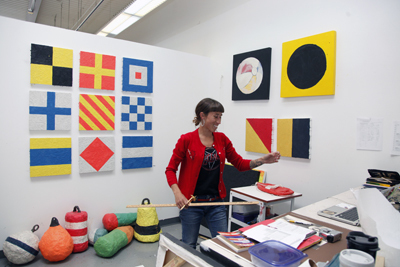 Residency participant Jessica Meuse reflects on her time in Los Angeles at the L.A. Summer Residency at Otis College.